Sky’s Edvald Boasson Hagen followed up Mark Cavendish’s win yesterday with one of his own. 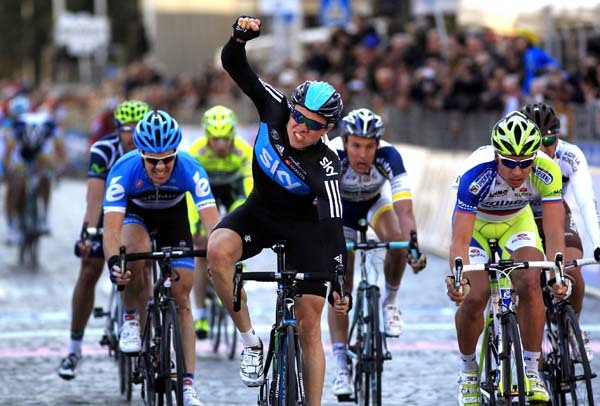 The Norwegian stomped down the cobbled streets in Terni today and held off André Greipel (Lotto-Belisol). Peter Sagan (Liquigas-Cannondale) – for a second day running – surged forward in the final metres, today for third place. Matt Goss retained the leader’s blue jersey since his GreenEdge team won the opening time trial leg. Team-mates Stuart O’Grady and Cameron Meyer are second and third overall at three seconds. Different teams came to the front to take the leader’s jersey, but mostly to position their men for the sprint. 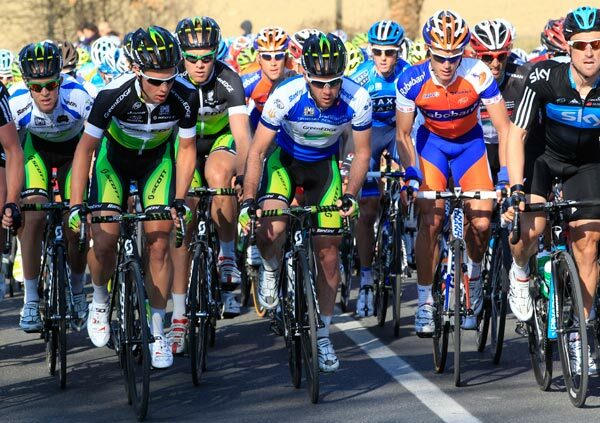 RadioShack, Lotto-Belisol and Liquigas ripped around the ring-shaped circuit, Sky had Boasson Hagen in tow. 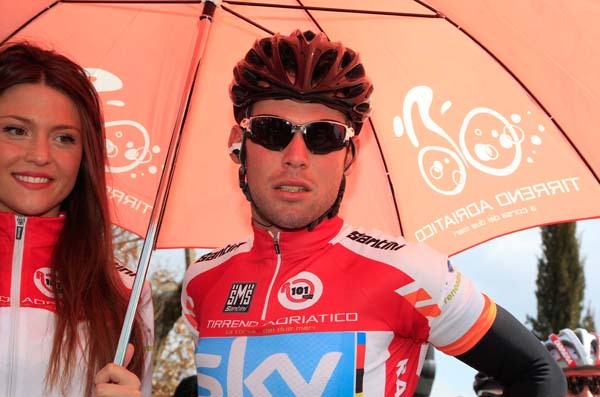 Cavendish, today in the red points jersey, was noticeably missing. The race crosses the Apennine Mountains for three days before its finish, a time trial, in San Benedetto on Tuesday. Sky’s Ian Stannard and GreenEdge worked hard all afternoon, from the blustery start in Indicatore, where Cavendish won yesterday, to the death of the lone escapee. Italian Filippo Savini (Colnago-CSF Inox) attacked at kilometre zero in the 178-kilometre stage and gained 11 minutes. His day ended at 28 kilometres remaining when BMC Racing closed off the others’ work. Daniel Oss hit the front for Sagan, Lampre followed and Sky advanced. Greipel had Marcel Sieberg to help, but Boasson Hagen squeezed in and muscled ahead. Goss will likely wave goodbye to his lead tomorrow, however, he may have more of a chance to keep it. This afternoon, after reviewing weather conditions, organisers cut the Passo Lanciano 50 kilometres before Chieti. Lanciano climbs to 1310 metres, too high with the cold weather. Prati di Tivo at 1450 metres, the finish of the fifth leg on Sunday, faces the same risk. Organisers for now have cut Lanciano, but maintained the distance at 252 kilometres. Tirreno-Adriatico 2012: Who will win?